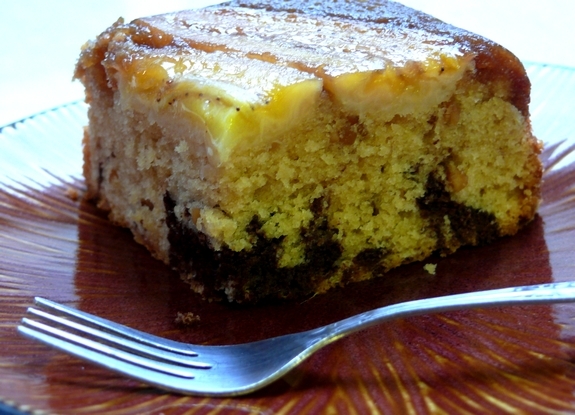 Oh my this is a sinfully delicious cake. 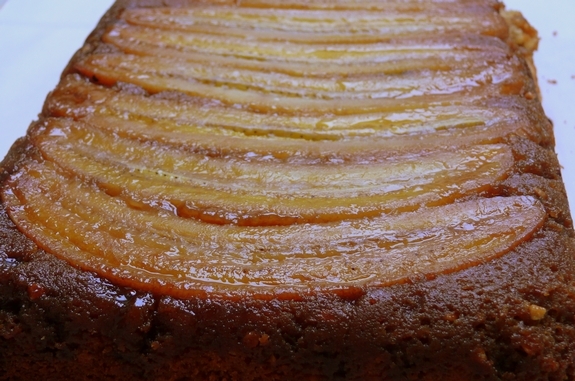 A great take on the pineapple-upside down cake of my youth. I have to say though, this is much more my style. It’s my favorite flavor combination of all time! Reminds me of my favorite muffins. Anyway, while this cake has a few more steps than just a regular old cake, it is so worth the effort. The presentation is also beautiful with the caramelized bananas on top. I have to say I was so worried this cake was not going to flip out properly, but it came right out of the pan without incident. I used a large cutting board covered with parchment paper to flip it out. Worked like a charm. So for your next gathering,garner a big wow, and make this cake. Preheat the oven to 350o F and lightly butter the sides of a 9 x 13 glass baking dish. 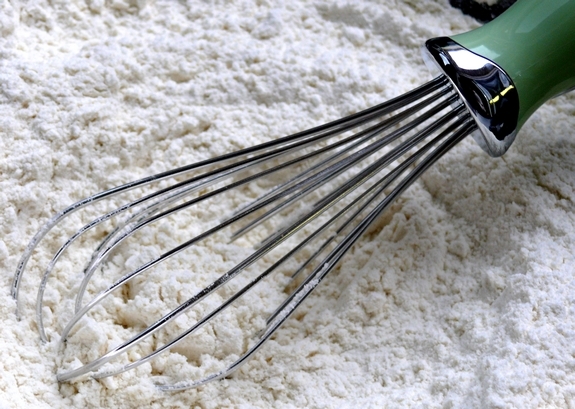 In a medium bowl, whisk the flour with the baking powder and salt. In a standing electric mixer fitted with the paddle, beat 2 sticks of the butter with the granulated sugar at medium speed until very fluffy; 5 minutes. Beat in the eggs, one at a time, then add the vanilla. In 3 alternating batches, beat in the flour mixture and the milk. 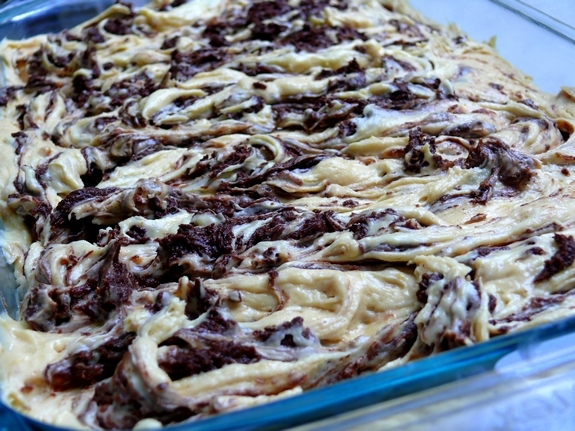 Transfer one-fourth of the batter to the medium bowl and stir in the melted chocolate. Beat the peanut butter into the remaining batter. In a small bowl, blend the remaining stick of butter with the brown sugar and spread it in the baking dish. 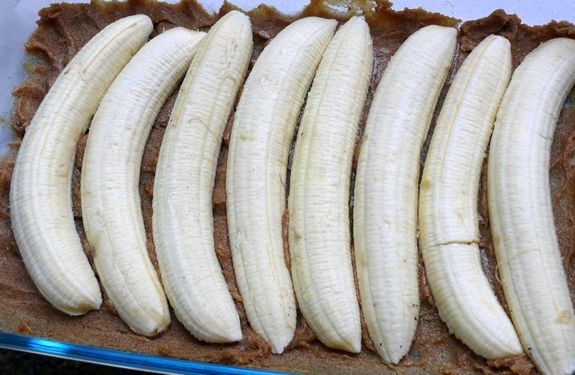 Arrange the bananas, cut side down, in the dish. 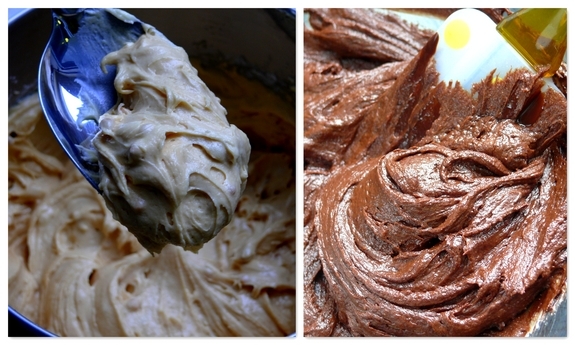 Spoon dollops of the peanut butter batter into the dish and fill in the gaps with the chocolate batter. Gently swirl the batters together with a table knife. Set a baking sheet on the bottom rack of the oven and bake the cake on the center rack for 60-65 minutes, until a toothpick inserted into the center comes out clean. Let the cake cool on a rack for 10 minutes, then invert it onto a platter. Let the cake cool slightly, then cut into squares and serve. The unmolded cake can be refrigerated for up to 3 days. Let the cake cool slightly, then cut into squares and serve. The unmolded cake can be refrigerated for up to 3 days. Oh my stars this is a winner…wow! this cake is basically my dream come true. thank you! Nothing about this recipe I don’t LOVE! ok bookmarked fo sure! hello! As if pineapple upside down cake wasn’t my favorite, now you throw this one at me? Gotta try this for sure. Thanks for sharing. OH wow, this looks divinee! i am literally going bananas over this! Might be a stupid question, but I don’t seem to get that part. Can you explain what that means? Love this combination of flavors. What a scrumptious looking cake. It is just amazing how you captured the “flavors” in your photos. I can taste it and smell it! YUM. I will eat anything that has chocolate and bananas in it. wow this cake sounds amazing and has some of my favorite flavors! It does look wonderful. 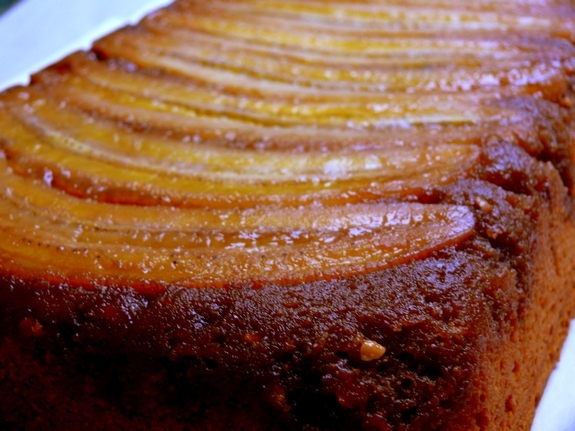 I love bananas and I love upside down cake. Wow, that would impressive to serve for a dinner party dessert. OMG, I started drooling like one of Pavlov’s dogs when I read this. Guess I’m going to be very busy baking this weekend. This means, add 1/3 of the flour and start mixing, next add half the milk, then another 1/3 of the flour, then the remaining half of the milk, ending with the last 1/3 of the flour. Do not overmix. I tried this yesterday and had a disaster. Somehow I ended up with too much batter and it overflowed onto the pan on the bottom rack and burned, burned, burned. It looked like the brown sugar was overflowing and burning. Did you end up with too much batter? Maybe I should have put less in the pan. I’m not giving up. I’ve got to have this cake. Om nom nom. That’s all I gotta say. 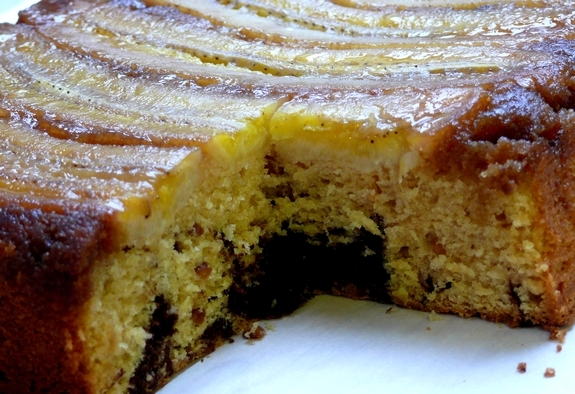 Bananas, peanut butter, and chocolate… you can’t go wrong! I’m new to your blog but saw this and had to make it immediately. It is so yummy! I was actually able to make two whole cakes with the batter and both came out perfect! Definitely a hit! Love your blog! Made this recipe on the weekend and it has officially been banned from ever being made again. A very first for any recipe in my house! Made this cake tonight and it overflowed a little bit. Still waiting for it to cool off! can you please tell me how many this cake serves and is there a reason for using a glass pan? I am making it for the first time and want to make sure it turns out amazing!